Earn up to 17,975 reward points. Science and art come together. 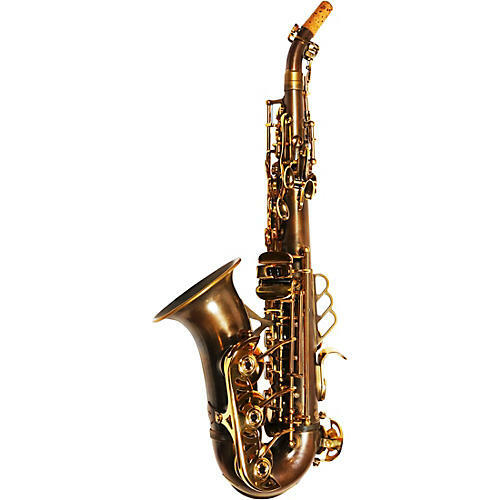 The MANTRA saxophone is one of the most advanced soprano saxophones available today. The MANTRA sounds full, fat and robust, more like the alto and tenor saxophones. It has incredible altissimo, and integrates many new innovations and features. The legendary Courtney Pine, among many others, have switched to the MANTRA. The MANTRA soprano’s innovations include new ergonomics, ‘boundary-layer-effect’ (similar to a shark’s skin which allows it to glide better through water), Theo’s angled three-ring-strap-hook, improved bore design, advanced key adjustments. The result? A warm, fat, and more beautiful sounding soprano. Curved (shown here) – A bit brighter and livelier. Big super clean sound that is easy to hear as the bell points upwards. Comes in vintified finish with gold lacquer keys only. Straight – The classic straight soprano. Big full and clear sound. Comes in Platinum or Vintified finishes. Tipped Neck – The tipped neck adds warmth and texture to the sound. The horn body is angled down for comfort as well. Comes in vintified finish with gold lacquer keys only. • For a brighter sound the DURGA mouthpiece is the perfect choice. • For a darker sound the GAIA mouthpiece is the perfect choice. Own this pro-level instrument. Order today.